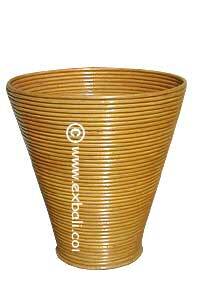 including Rattan Vases , Rattan Mirror Frames, Tables and Rattan Products woven from Banana Leaf, Water Hyacinth and Sea Grass or combinations of any of the above. 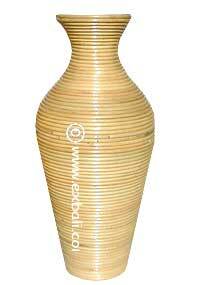 Rattan Decor Accessories; Rattan Vases, Baskets Bowls and Plinths. These unique rattan furniture accessories are created from lengths of 10mm rattan and curved to create the objects pictured below. 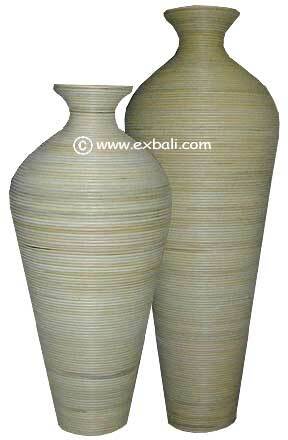 These very sturdy products are ideal for indoors...Largest Size 1.8 meters (180cm ) tall. To create colors wood stains are used, please review the Color Chart for coloring options. 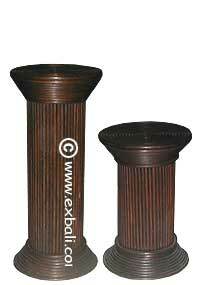 Pictured left to right Basket 60 -50 cm and Plinths 60 - 40 cm. 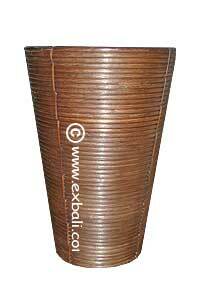 Bali Handicrafts and Products from the Islands of Indonesia.